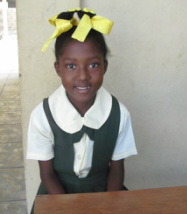 No schools are free of cost in Haiti. due to lack of tuition. Our Educational Scholarship program allows young people to attend school who would otherwise stay home for lack of funds. Each family’s economic situation is assessed by our local staff, and families commit to supporting their student and the MPM Haiti Scholarship program. Parents are asked to make a small investment of time or money to show their commitment to their child’s education. Parents and students commit to caring for and returning textbooks each year. Students commit to maintaining good grades on the Haitian educational scale and exemplary attendance records. MPM Haiti’s Educational Team regularly visits schools to support students and maintain close relationships. Families no longer have to choose between feeding and educating their children. Students and their Educational Scholarship Sponsors communicate through letters and make meaningful connections.